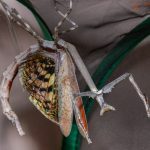 Heterochaeta orientalis is among the largest species of praying mantis kept in captivity (11-12cm). Heterochaeta orientalis is a stick mimic, with its long and slender appearance, strikingly resembling a part of a branch. It has two conical protrusions on top of both eyes that are distinguished giving rise to its ‘cat mantis’ common name. Heterohaeta orientalis generally has a medium to dark brown coloration and sometimes develops tinges of green, usually on the femur and tibia in its nymph stages.